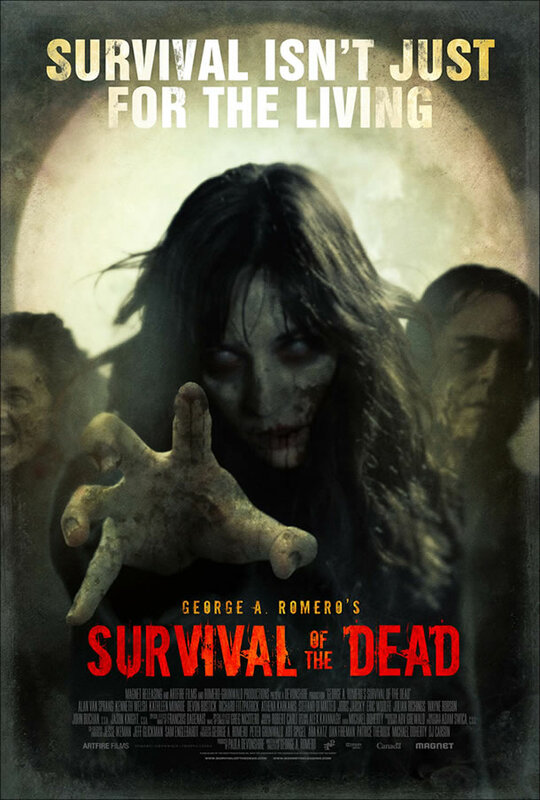 “Survival of the Dead,” the sixth installment to George A. Romero’s trailblazing Dead franchise, attempts to take his zombie mythology to the next level. Although this movie continues Romero’s commentary on humanity in a supernaturally frightening context, the new truths within his zombie reality hint at interesting and unexpected changes for the work of the 70-year-old auteur. Romero has entertained the possibility of conditioning zombies to regain their humanity since 1985 in “Day of the Dead.” In that story, the overall effort was futile, save the instance where a zombie named Bub escorts a particularly bad human character to his end. Naturally, the audience celebrates such an act. Still, Romero hardly presents sufficient evidence to suggest that all zombies are worth saving. And herein lies the conflict on Plum Island, the primary locale for “Survival of the Dead.” An Irish-rooted community off the coast of Delaware, Plum Island is home to the O’Flynns and the Muldoons. The O’Flynns and the Muldoons have been feuding since (probably) not long after they first crossed the Atlantic (if not before). Of course, the catastrophic event of the dead rising and walking again would help the families reevaluate the importance of their conflict. Alas, instead of the zombie phenomenon uniting these families against the walking dead, the age-old rivalry simply finds new rationale to continue it. Patrick O’Flynn (Kenneth Welsh), the patriarch of his clan, meets resistance Seamus Muldoon (Richard Fitzpatrick) opposes the effort to rid Plum Island of its zombies. Muldoon contends that the zombies, who were once family members, should be kept alive until the living can find a cure for the undead. Unfortunately for O’Flynn, cure-by-gunshot is unacceptable to Muldoon, so Muldoon and his clan exiles O’Flynn off the island. Setting up camp at Slaughter Beach (Slower Lower, Stand Up! ), O’Flynn connects with a group of national guardsmen (also featured in “Diary of the Dead”) and convinces them to help him sneak back onto Plum Island. When O’Flynn and the guardsmen return to the island, they learn that the Muldoons have been not only been trying to domesticate the undead, but they’ve also been murdering the innocent people who seek refuge on Plum Island. These discoveries set the stage for a war on Plum Island in which the enemies aren’t so much the undead, as much as the people in dispute over what to do with them. Zombies can ride horses. The undead resuming activities that occupied them in life is not a new development for Romero. But the motor skills required to mount, ride and dismount a horse are a tall order for a zombie who can barely put on foot in front of the other in alternating succession…unless you’re watching this movie, where it’s a piece o’cake. Horses on Plum Island don’t get tired. Naturally, a zombie has no sense of time, so a zombie with the ability to ride horses wouldn’t know when it’s time to let a horse rest. Luckily for the equestrian undead on Plum Island, the horses there have no sense of fatigue, making the zombie-horse team unstoppable. Horses ruin everything. It is best not to present examples for why this is true, but should you watch “Survival of the Dead,” you will see the truth in that statement for yourself. I’m not sure that I’d see “Survival of the Dead” again, but that doesn’t mean it’s completely unwatchable. For zombie movie fans who are interested in how a zombie movie can, interestingly, not be about zombies at all, “Survival of the Dead” succeeds and stays true to the groundwork that Romero has laid since the late 1960s. What Romero intends to do in continuation of this series is uncertain, but he has definitely suggested some interesting possibilities with the additions he’s made to his own mythology. And did I mention horses? Don’t forget about the horses. Next: 20th Century Fox Set to Sue B. A. Baracus?